Mission m7c2 center channel speaker & 77DS rear surround Pr. NO RESERVE AUCTION! Mission m7c2 center channel speaker & matching pair of Mission 77DS rear surround wall mount speakers in excellent condition. Audiophile grade speakers, handcrafted in England. All 3 have recently been professionally tested, and everything functions and sounds perfect. Mission e80 Elegante Speakers. The e80 speakers are designed to be used close to rear walls, either on the included wall brackets or on stands. Single Mission Argonaut 780 3-Way Crossover / Excellent Condition / Functions Perfectly. A rigid stand is supplied with the speakers which locks onto the included wall bracket if required. Mission 'Elegante. e 8C is a very beefy, high quality speaker. The wall mount and stand are made from very heavy duty cast aluminum. MISSION Speakers Sign 32 x 12"
We cater to music enthusiasts and audiophiles, and we love what we do. We design audio systems for all budgets, from entry-level to high-end. Professionally refurbished, floor model. We stand by our products. One pair of Mission 77DS Diffuse surround sound speakers in white color. One of the speakers. 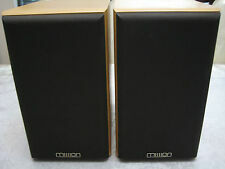 speakers are in excellent condition and have altogether around 30 hours of use on them. The goal of Mission speakers is to provide a wide spectrum of sounds. Surround speakers are configured to cover wide ground between at least two modules. The new and pre-owned Mission speakers on eBay are made for open rooms and are enclosed in wooden cabinets having gray, brown, or black finishes. What is the sound level on Mission products? Volume is adjustable to meet the levels you need and when. These speakers are complete with direct controls; they provide a spectrum of options that alter textures and tone. Bass, treble, and mid-level controls are provided for your direct oversight of sound, volume, and quality. The volume of Missions speakers is based on its average wattage output of 100. Each joule of electricity cycles through a cabinet and sustains the signal from your digital devices, mixers, and instruments. Start considering the connection you need and what audio signals you expect to play. With the inexpensive Mission speakers on eBay, you can find the immediate creation of a magnetic field to replicate the sound of that audio input. Where does the actual sound come from? Coils - Coils are wires wrapped into a tight bundle at the base of the speakers. The magnetic charge of coils allows a signal to move as an uninterrupted current. Heres where the entire sequence begins. Magnets - A magnet is added to work against the negative and positive charges of the coils. The objective is to maintain as much clarity as possible when projecting your sound. Polarity - The opposing polarity of these components are there to thrust sound out of the diaphragm and at rates you can set and control. How much power does a Mission speaker need? Power is gained with electrical outputs or through a powering system from the device youre using. Mixing tables are powered through outlets and generators also. Being connected to one would power your speakers. A useful power cord is provided to energize the Mission module directly with a wall outlet. Content provided for informational purposes only. eBay is not affiliated with or endorsed by Mission.